Analytical Armadillo: What an attached parent is, and isn't. "Attached parenting" (AP) evokes images of hippies, lentils and mothers knitting their placentas whilst the toddlers run wild; no respect, routine or reliability and never sleeping until midnight. Babies constantly attached to their mother's breast in a ring sling whilst she steps over the cluttered house she will surely never have time to tidy. Like most stereotypes, this is no more accurate than any other - so let's look at how AP is actually defined. "The essence of Attachment Parenting is about forming and nurturing strong connections between parents and their children. Attachment Parenting challenges us as parents to treat our children with kindness, respect and dignity, and to model in our interactions with them the way we'd like them to interact with others. Attachment Parenting isn't new. In many ways, it is a return to the instinctual behaviors of our ancestors. In the last sixty years, the behaviors of attachment have been studied extensively by psychology and child development researchers, and more recently, by researchers studying the brain. This body of knowledge offers strong support for areas that are key to the optimal development of children, summarized below in API's Eight Principles of Parenting." Feed with Love and Respect - breastfeeding is the optimal way to satisfy an infant's nutritional and emotional needs. "Bottle Nursing" adapts breastfeeding behaviours to bottle-feeding to help initiate a secure attachment. Follow the feeding cues for both infants and children, encouraging them to eat when they are hungry and stop when they are full. Offer healthy food choices and model healthy eating behaviour. Respond with Sensitivity - build the foundation of trust and empathy beginning in infancy. Tune in to what your child is communicating to you, then respond consistently and appropriately. Babies cannot be expected to self-soothe, they need calm, loving, empathetic parents to help them learn to regulate their emotions. Respond sensitively to a child who is hurting or expressing strong emotion, and share in their joy. 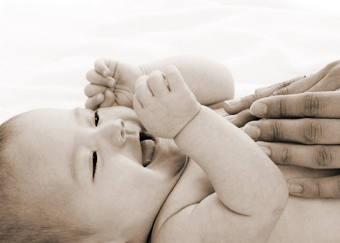 Use Nurturing Touch - touch meets a baby's needs for physical contact, affection, security, stimulation, and movement. Skin-to-skin contact is especially effective, such as during breastfeeding, bathing, or massage. Carrying or babywearing also meets this need while on the go. Hugs, snuggling, back rubs, massage, and physical play help meet this need in older children. Ensure Safe Sleep, Physically and Emotionally - babies and children have needs at night just as they do during the day; from hunger, loneliness, and fear, to feeling too hot or too cold. They rely on parents to soothe them and help them regulate their intense emotions. Sleep training techniques can have detrimental physiological and psychological effects. Provide Consistent and Loving Care - babies and young children have an intense need for the physical presence of a consistent, loving, responsive caregiver: ideally a parent. If it becomes necessary, choose an alternate caregiver who has formed a bond with the child and who cares for him in a way that strengthens the attachment relationship. Keep schedules flexible, and minimize stress and fear during short separations. Practice Positive Discipline - positive discipline helps a child develop a conscience guided by his own internal discipline and compassion for others. Discipline that is empathetic, loving, and respectful strengthens the connection between parent and child. Rather than reacting to behavior, discover the needs leading to the behavior. Communicate and craft solutions together while keeping every one's dignity intact. Strive for Balance in Personal and Family Life - it is easier to be emotionally responsive when you feel in balance. Create a support network, set realistic goals, put people before things, and don't be afraid to say "no". Recognize individual needs within the family and meet them to the greatest extent possible without compromising your physical and emotional health. Be creative, have fun with parenting, and take time to care for yourself. I don't think the principles are really that out there? It doesn't mean you have no routine, never put your child to bed, carry them 24/7 and aren't "allowed" to put them down, nor do you have to breastfeed! It purely means you're up for taking a look at the evidence and responding sensitively to your infant. Responding doesn't turn babies into spoilt brats who will control you ever more, on the contrary Penelope Leach, doctor of psychology has reviewed more than 150 scientific sources and believes the opposite is true. One study in particular examined outcome when three sets of parents looked after babies in different ways. The first group fed their children on demand, carried them around with them, slept with them, and responded instantly to their crying. The second group was attentive but strove for the beginnings of some separation. And the third operated on the Fordesque “controlled crying” basis, only picking children up to be fed when the routine allowed. So often the view of babies and children in our society seems so negative - they will attempt to control, manipulate, want to stay up all night if they possibly can (why the assumption they don't want to sleep rather than for some reason they can't?). Some propose ignoring the child's requests or cues enforcing a set routine - even though we know a one size approach doesn't fit all. To say we see ourselves amongst the smartest mammals - we seem to have almost Victorian view of babies that is so far set from a large body of scientific evidence it's baffling. So back to the hippy earth mother that is apparently the "AP" - and a few images of some who practice AP: Angelina Jolie, Nell McAndrew & Miranda Kerr. Just a few who clearly have brains and beauty! And a thought - if the above 8 characteristics define an attached parent, is the opposite a detached parent? RELATED POSTS: Modern Parenting Techniques, Leaving Infants to Cry & Depressed Toddlers? The myth of AP children being spoiled brats, having their parents wrapped around their fingers, throwing tantrums etc is one that really gets it wrong. However, I myself was once weary of 'spoiling' my baby and had to see it to believe it is actually the exact opposite. Do we have to strive to look like those 3 AS WELL as APing!!! OMG I've no hope!!! ;-) lol Going back to my lentil weaving now! "Babies cannot be expected to self-soothe, they need calm, loving, empathetic parents to help them learn to regulate their emotions." I know parents who would agree whole heartedly with this and see CC as a way of teaching children to self-soothe. Of course, you and I know the deeper issues, but they would still feel they could tick all boxes. I agree @Cookie, it becomes very obvious when you attend various activities like Toddler Groups / soft play where lots of young children and parents are present. You can actually see first hand parents interating happily and gently with their children, and those children are calm, relaxed, smiling and happy to share and play with others. In contrast, those parents who I overhear talking about sleep training, and see constantly disciplining their children and trying to "teach" them to behave, tend to have stressed, aggressive children who kick up an almighty tantrum when another toddler tries to share a toy. It seems like a massive generalisation... but it is what it is when you can literally see it on a bigger scale right in front of your eyes! Katie, Rae's point was that someone who is a firm believer in crying it out still believes they are teaching their child to self-soothe and believes they are doing the right thing. They aren't saying, "I'll make my child cry because s/he deserves to cry," they're saying things like, "My child cries a lot and this method really works to help them self-soothe." Obviously attachment parents see that this is not the case and are adamant against letting infants cry it out, but the parents who DO make their kids cry it out/practice controlled crying truly think it's a good thing, so they would look at this list of attachment parenting tenets and still be able to "tick all the boxes." Many CIO-ers believe it's right, and therefore believe they are accomplishing the items in the category of responding with love and affection, even when the baby wouldn't see it that way, and APers wouldn't believe it that way. So, I just wanted to clarify. I think Rae is right on: most parents, even non-AP parents, would say that they do everything on the list when it's written in generalities like, "respond in a loving manner" because a "loving manner" is so subjective. Or saying they need a "loving responsive caregiver" could mean that the parent pops their head into the room every 5 minutes to "respond" and "reassure" the baby that they were still there. We know that doesn't count and doesn't work, but I can see how someone might feel it does. When it's more clearly cut, however, such as "APers do not practice crying it out or controlled crying," THEN the other parents would not check the boxes and would no longer mistakenly feel that they were practicing AP. No, I don't think the principles are that far out there either...they seem like common sense to me. Although it's just amazing how many people are threatened by the AP principles. I also just don't understand parents who view their infants as manipulators. How sad to have be looked at in a bad light by your parents when you're just a baby. I wish it was called instinctual parenting instead of attachment patenting, because people see the "attachment" part as a negative thing. I think most mother's instincts tell them that they should follow these principles. And when people question my parenting style, I tell them that I have been given my instincts for a reason and I always listen to my heart over the "experts." i do wish though that there were more oosts about how even if you do practice AP and your toddler still chucks tantrums out of frustration, that it is ok, it does still happen... what makes me disheartened sometimes is when i hear all these parents saying they practice AP and so their children never have any need to chuck tantrums. Mine did/do and i sit with them through it, and i think it would be more endouraging or realistic a view that yes, AP'd children still have meltdowns and disregulation but they may come down from their distress more readily, or are allowed to actually show distress - we need more 'realistic' not 'perfect' in my opinion. The reason why I think is that despite the fact that AP is all those things, some AP parents DO in fact talk like you have to hold the baby 24/7, nurse constantly, co-sleep, and never say no to be AP. I have heard people say that being AP means not saying no, not asking kids to share, not moving to their own room even if co-sleeping is making mom and dad miserable, never using a stroller, etc. Honestly, I think some of the reasons people don't like AP has nothing to do with what AP is, it has to do with how AP parents act about what AP is. I don't feel the need to give myself a parenting style label or join a parenting style group, we are all different as mothers, all babies are unique & have different needs, & what works for one family doesn't work for another. I have a friend who practices AP & what works for her, her baby & her family is great, I fully support her co-sleeping & EBF, but I find it sad that if you don't co-sleep & BF, there are some women out there who have you down as some kind of half-mother, selfish, or a failure as a woman. Why can't we all just accept & support each other as women? It broke my heart when I couldn't BF my baby, it's a long story, but yes I did have to switch to formula. I have never co-slept - my baby has always liked her own space to stretch out & literally struggles to be put down when she is sleepy. I guess she has a routine in that she is hungry & sleepy at the same times each day & I respond to that. She sleeps in her own room in her cot & she sleeps 12-13 hours at night, but that is just her, I haven't done any kind of sleep training! So does that make me a detached parent? It's just that, all day, every day, my God I am there for my baby in every single way possible, we have a visceral connection & I respond to her every need - & the sound of her crying, if in pain, literally makes me feel physically sick. She is my no.1 & always will be, she is a happy contented baby & I love her so much I just can't stop touching & cuddling her! So does that make me an AP? I just don't think it's that clear cut or even that necessary to have these labels. Like I say, we are all different, why do we have to "tick boxes"?? I dont like parenting style labels either. Its like labelling children by their behaviour. It doesnt say anywhere above that you have to co-sleep to be AP. So no, that doesnt make you detached! Agree, ticking boxes isnt what we should be aiming for, but the AP points above are all based upon evidence from studies, and therefore to understand and aim to achieve the princples should surely be a positive thing? In my opinion every baby is different and has different needs and only that baby's parents know how best to respond. I have a happy, content and healthy 21 month old. She was practically born sucking her fingers which is her way of self soothing. I respond immediately to her cries when she needs me, I breast fed for 9 and half months. She loves going for a ride in her pram and looking outward to see what's happening in the world around her. She never took to her sling and prefers her own space to sleep. She goes in to her cot awake, falls asleep happy and chatting to her teddies and wakes up happy and excited for the day. She does have her moments of temper but I calm her down and she is learning to communicate using sign and verbally what she wants. She goes to nursery every day, and is surrounded by lots of friends and people who care for her as well as I would. I'm told every day how clever she is. She mostly eats a healthy home cooked diet but has the occasional treat. I wouldn't change a single thing! Some people are too quick to judge about parenting styles. As long as mum, dad and baby are happy what's the problem!